Finally... a 45 degree day to get things moving around here! This one may be the costliest of all - at least to my time over the next few weeks. I'll provide the details later. There's a thaw coming here too! Yay Spring! Of course it will snow next week and I'll be all bitter again. C'mon, the temporary bridges can be fun. Just think of it as an obstacle course with ummm no prizes but a bummer of a consequence if you lose. How soon before teens are forecast again for you? 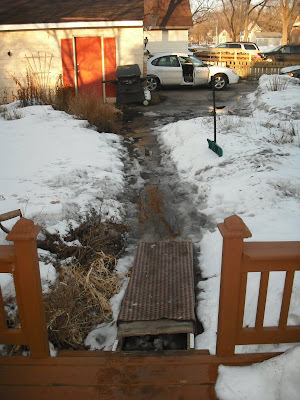 Strangely, we didn't have any problems when ours thawed out. We usually get totally waterlogged in out garden too! 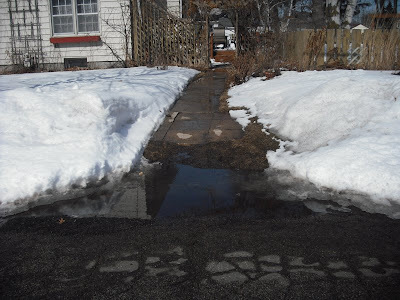 Our yard looks the same except the dog poop is floating in the puddles. Ugh, I don't miss the Minnesota meltdowns, especially having to wash the car every other day. Hope that load of sheetrock doesn't keep you from the blog much. Are you allowed to have a life? 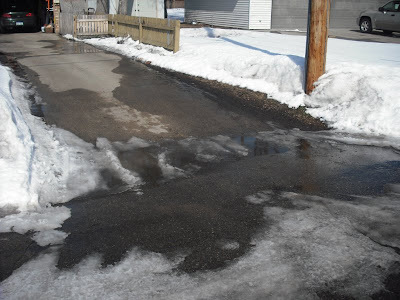 If a sloppy driveway is your biggest worry, I'd say you're doing pretty well. 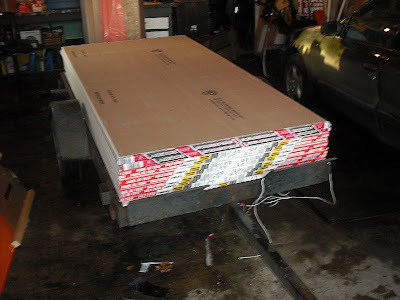 A garage full of sheetrock, tho, is a frightening proposition. This brings back memories, not all good, from just about a year ago when I tackled my very own sheetrock hanging project in my basement. It turned out well, but at the time I thought I was making a mess of it. Your pics got me over being jealous that the town hall's in St Cloud next week. You just talked me out of moving to the Mid-West. It was pushing 70 on Wednesday and I left work early to go bike riding. My dad used to puzzle over the fact that the Swedes chose to travel to America to settle in ... WTF ~ Minnesota? That sure looks familiar... our snow is slowly retreating, but with the forecast of severe flooding. Thank goodness we have a floodway to protect the city.